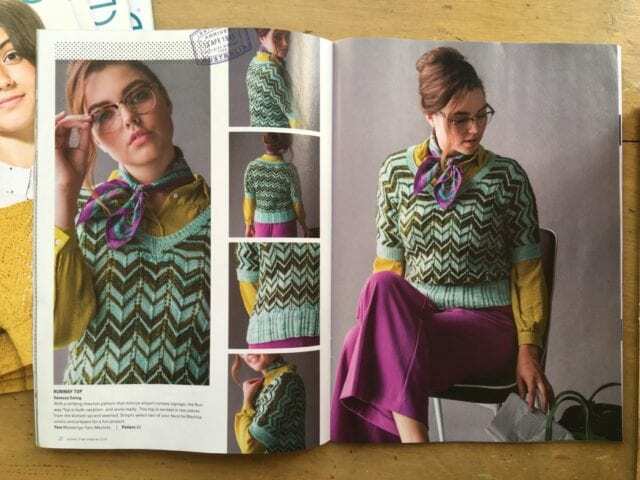 This issue of Knitscene features a tutorial on correcting lace mistakes and a bundle of brightly colored garments, like this chevron striped top in Malabrigo Mechita. 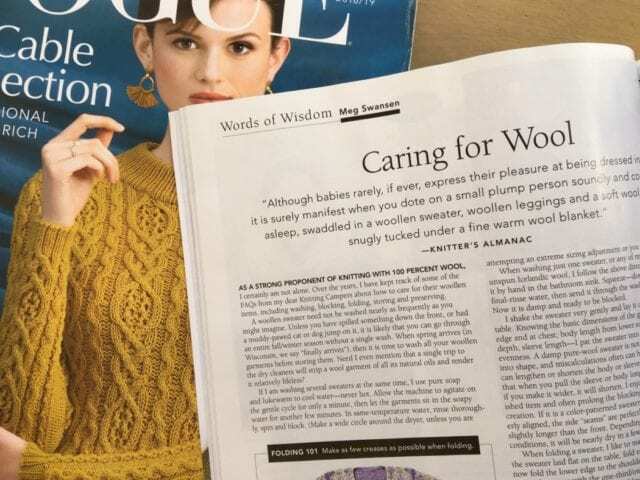 Vogue Knitting is focused, meanwhile, on cable knitting, and Meg Swansen’s column is all about caring for woolens. Look for these and other new books and magazines on the teacart here at our shop. See you there! 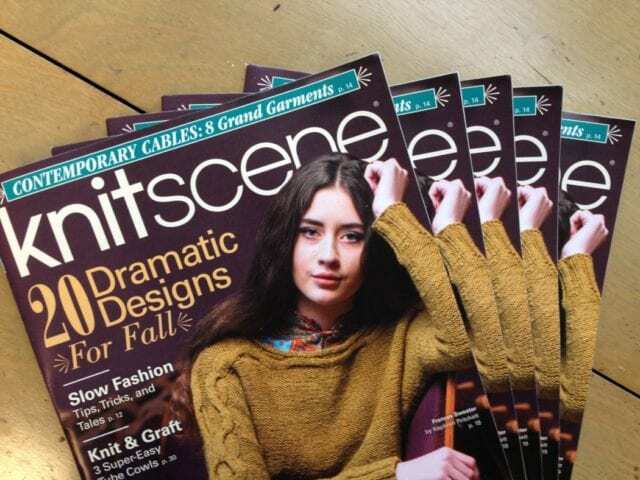 The Fall 2018 issue of Knitscene arrived this week! As the days get hotter, I start to fantasize about cooler days, though they’re months away. 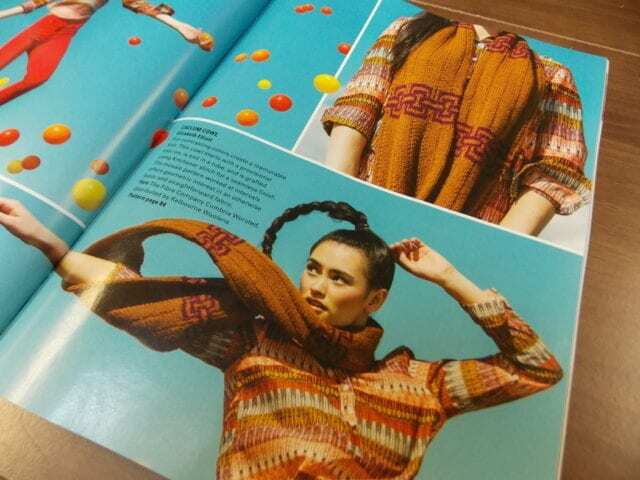 Magazines like this, full of woolen sweaters, can be a nice retreat from the heat of summer if it doesn’t happen to be your favorite season. 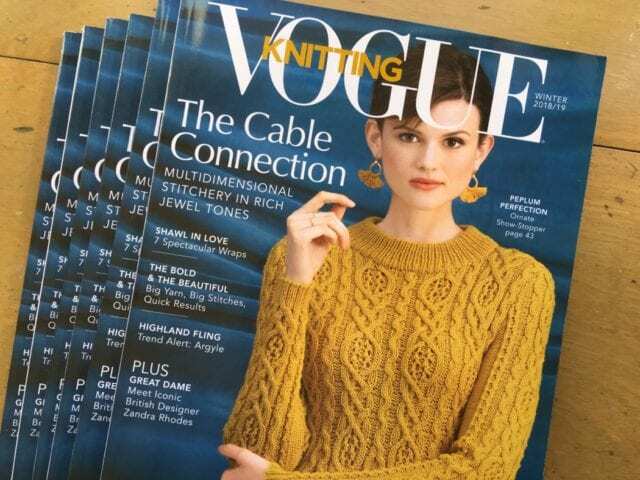 I spotted some of our favorite yarns in this issue; along with the cover sweater in Swans Island All American Worsted, there’s also a cabled cardigan in Brooklyn Tweed Shelter and a pullover in Fibre Company Cumbria Worsted. 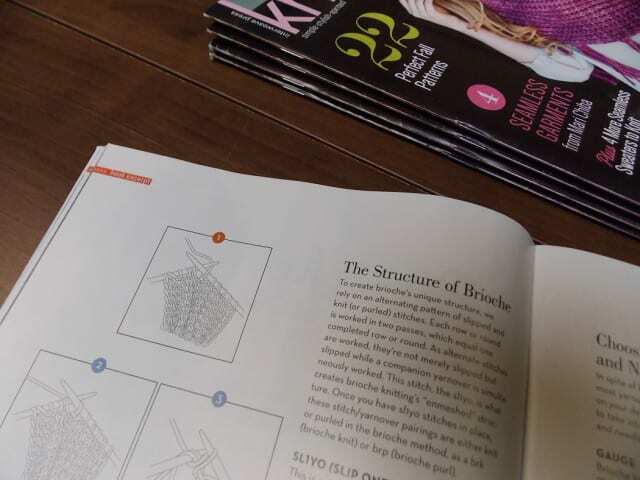 Look for Knitscene on the teacart, where the latest books and magazines are stacked high, ready to inspire your next projects. See you at the shop! 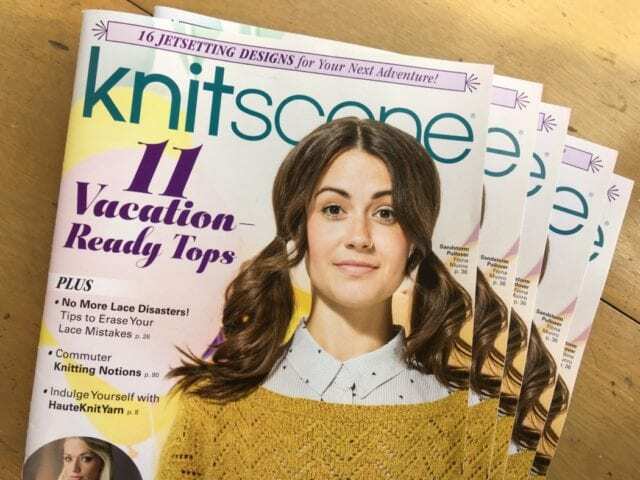 The Summer 2017 issue of Knitscene has arrived! This issue features lively warm-weather garments and accessories: tanks and tees, shawls and cowls, even a pair of knit shorts. 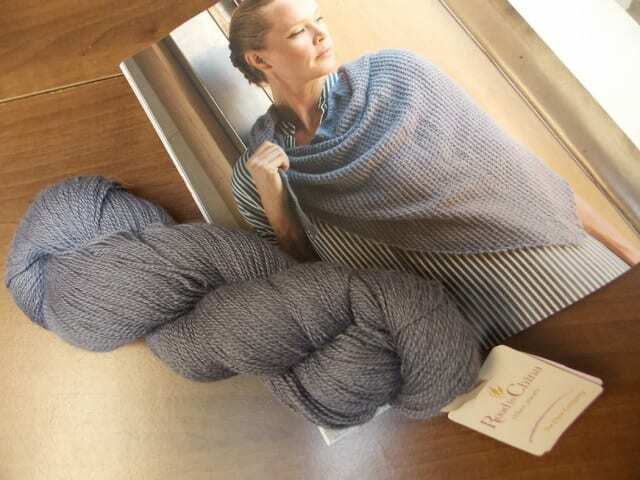 This striped “Crossover Tank” is shown in Cascade Ultra Pima, a machine-washable dk weight cotton. “Joni’s Lacy Cowl” calls for one of our favorite spring and summer yarns, Fibre Company Meadow, a lace weight blend of merino, llama, silk, and linen. 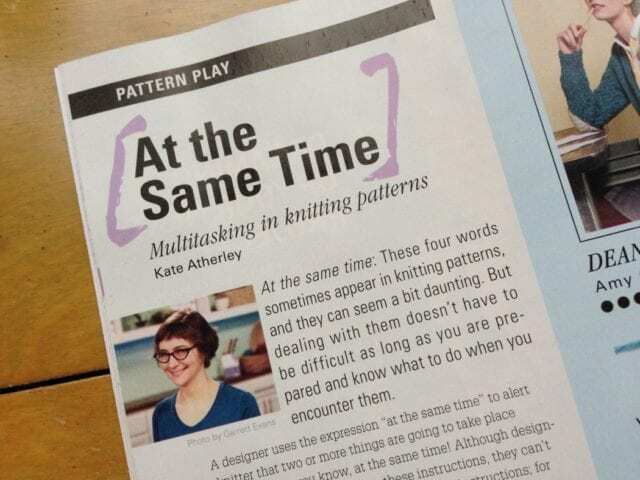 This pattern was recently featured on the Kelbourne Woolens blog; head in that direction to read more about it. 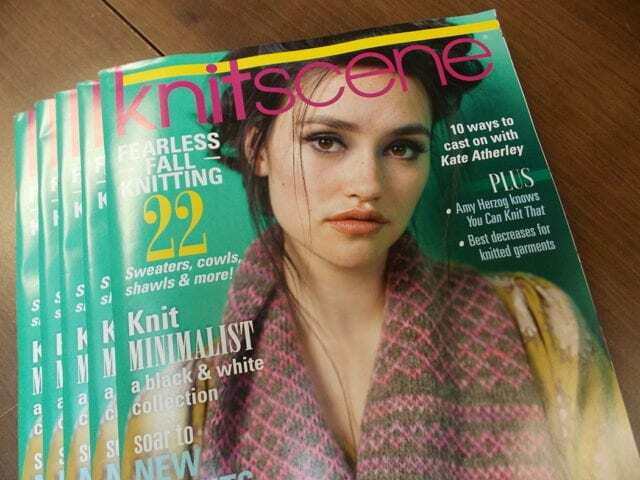 Look for Knitscene on the teacart here at the shop, which is crowded with exciting new books and magazines! 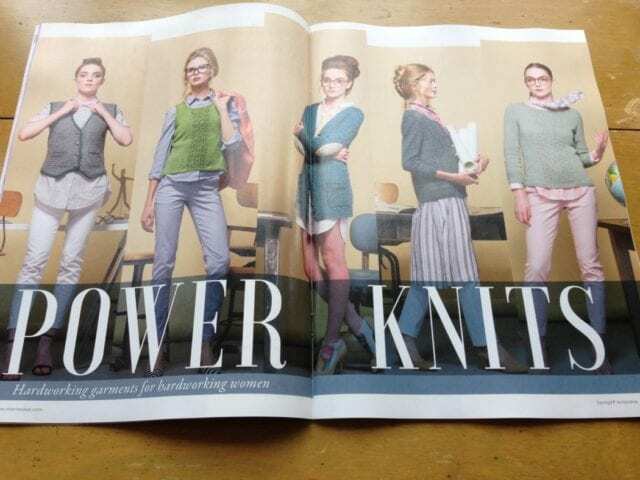 The Spring 2017 issue of Knitscene arrived over the weekend, an unseasonable but not unwelcome new magazine full of tempting patterns and useful tutorials. 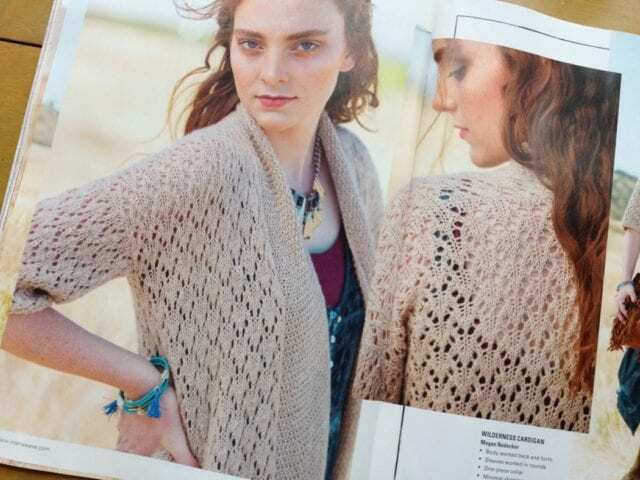 This lacy, open-front cardigan is knit in one of our favorites, Fibre Company Acadia, a soft and tweedy blend of merino, alpaca, and silk. 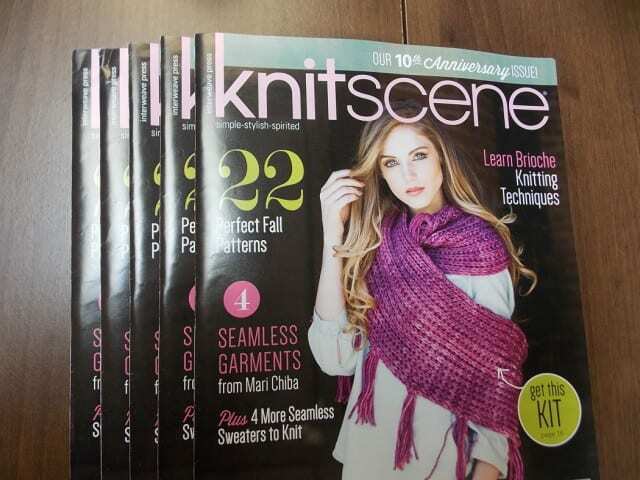 Look for Knitscene and other new publications here at the shop. See you there! 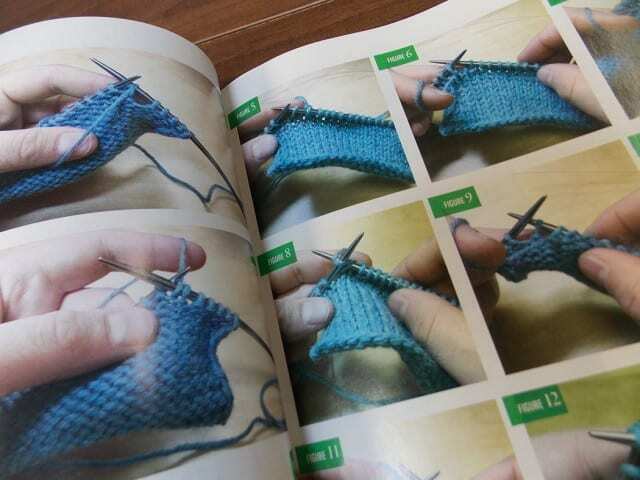 Two new magazines came last week, full of light summer reading, interesting patterns to knit, ideas, and tutorials. 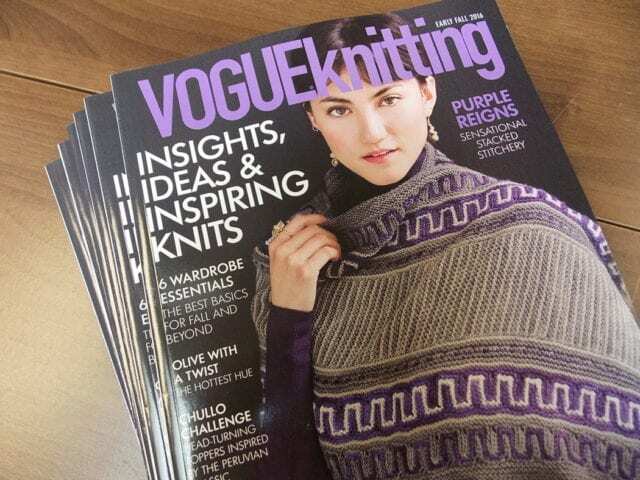 The Early Fall 2016 issue of Vogue Knitting features profiles of designers Faina Goberstein, Felipe Cavalheiro, and Xandy Peters, known for “Fox Paws” and other patterns with stacked increases and decreases. 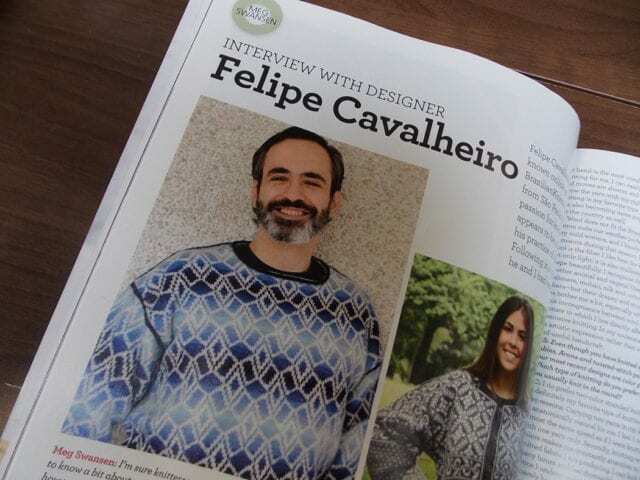 I always find it interesting to read about knitwear designers, how they came to do what they do and how, indeed, they do it. 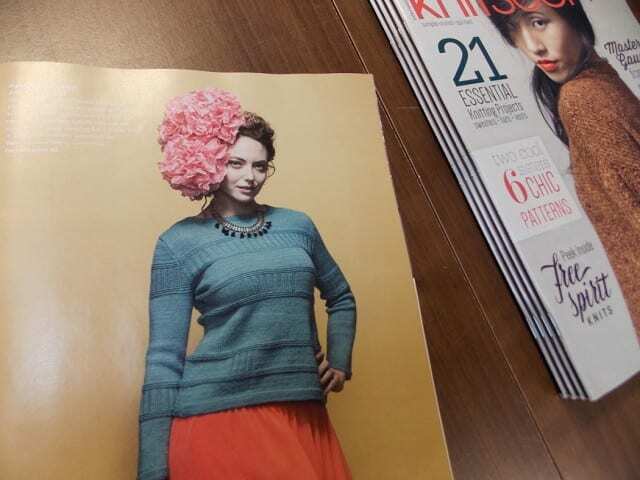 I also spotted a lovely colorwork hat knit in none other than Fibre Company Knightsbridge. 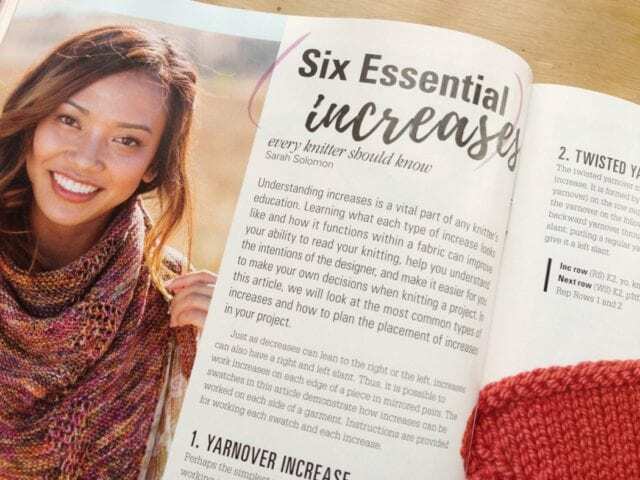 I noticed Fibre Company yarn in the Fall 2016 issue of Knitscene, too; the “Caelum Cowl” calls for Cumbria Worsted. 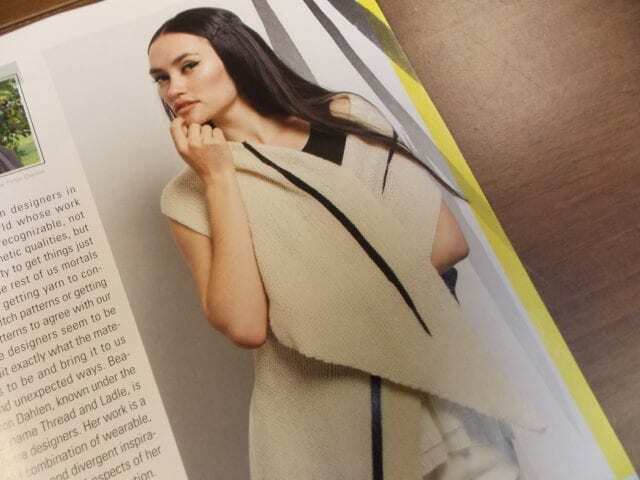 Other highlights of this issue include a cast-on tutorial and a collection of black and white garments, including this artfully simple shawl knit in Shibui Staccato. 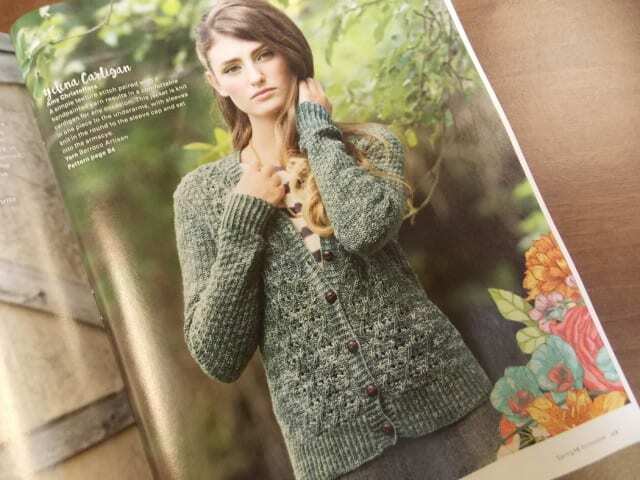 Look for Vogue Knitting, Knitscene, and many other publications on the teacart here at the Hillsborough Yarn Shop. 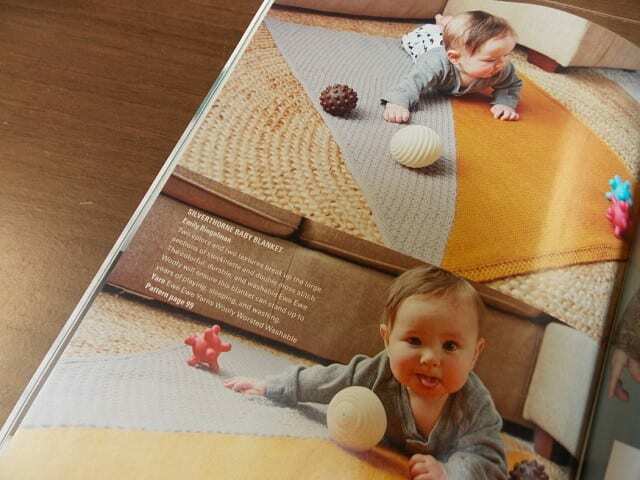 Come by to browse for inspiration or plan your next project! 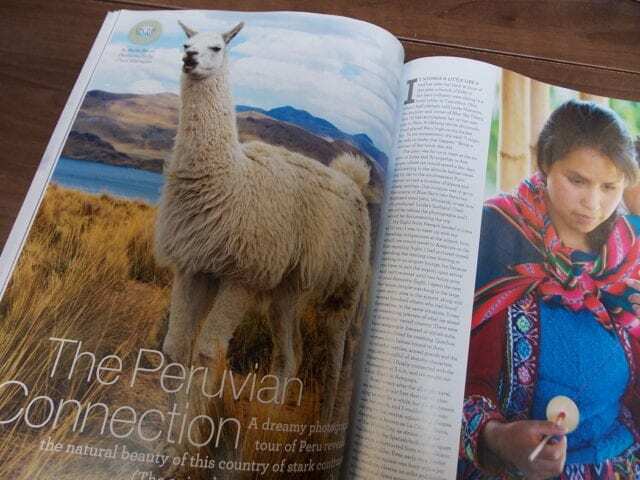 Last week, we welcomed a brand new magazine to our teacart, where the latest publications are stowed here at the shop. 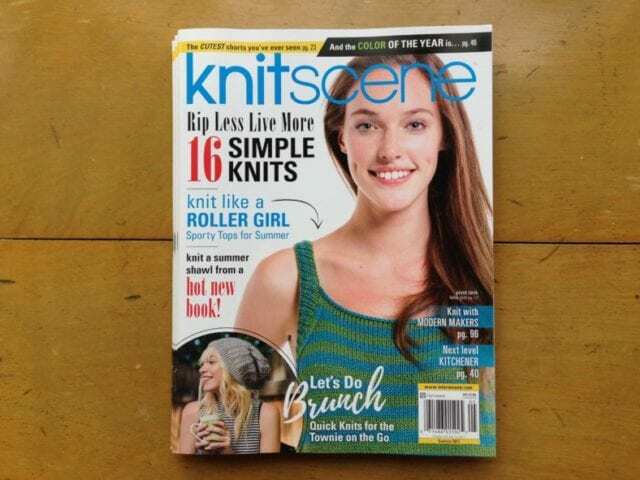 Take a peek at Knitscene Handmade! 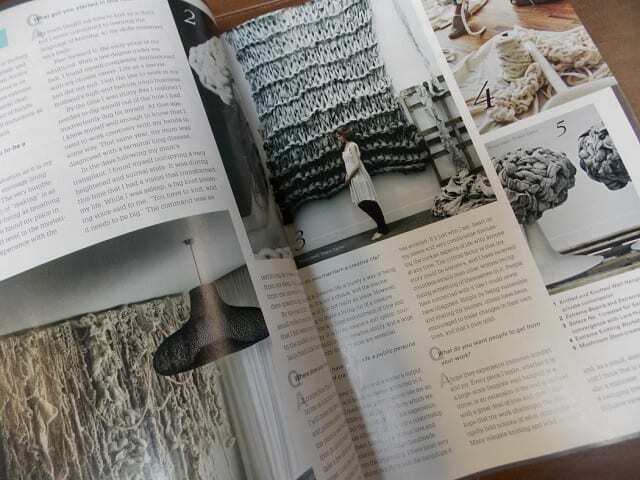 Knitscene Handmade profiles designers, fiber artists, hand-dyers, and all manner of makers, offering a glimpse at their life and work. 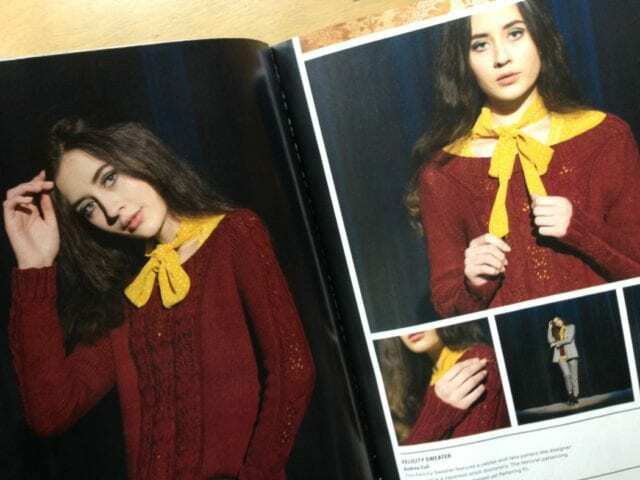 You’ll also find plenty of patterns, of course, whether you’re knitting garments and accessories for yourself and your friends, or have babies in your life to wrap in handknits. 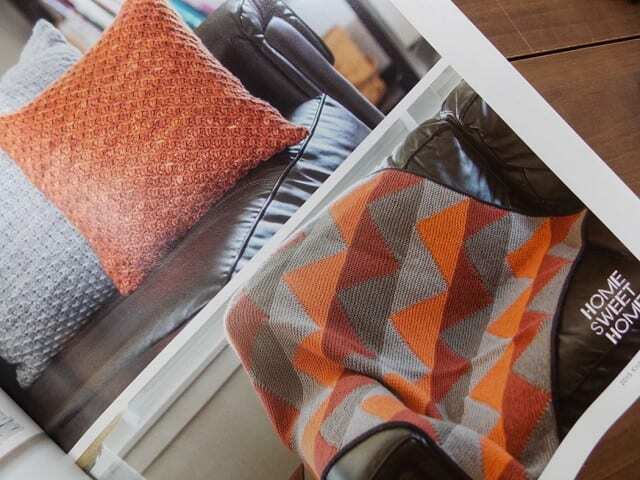 In each of those categories, Knitscene leans toward contemporary styling and bold color combinations, as in this textured baby blanket knit in Ewe Ewe Wooly Worsted. 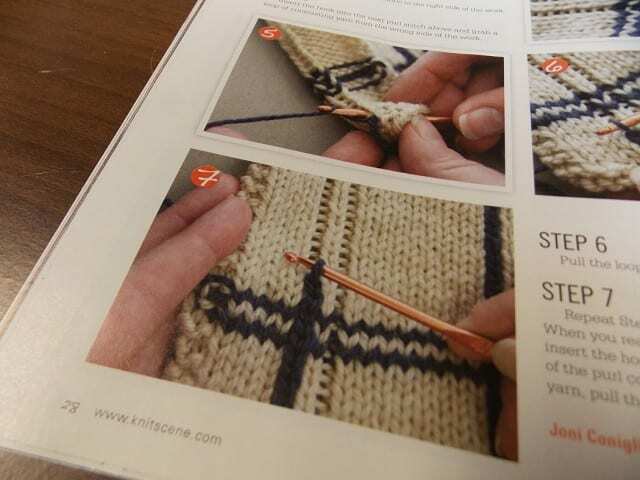 The editors at Knitscene recognize that one of the most rewarding parts of making things by hand is learning new techniques, and so this issue also features helpful tutorials on short-rows, grafting, and blocking. 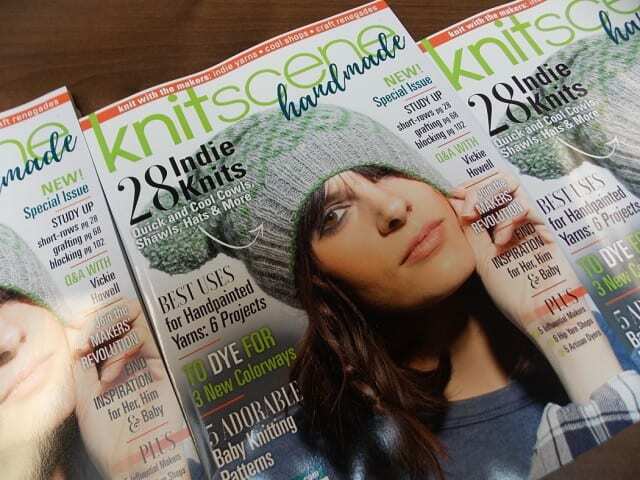 Look for Knitscene Handmade next time you’re here at the shop! 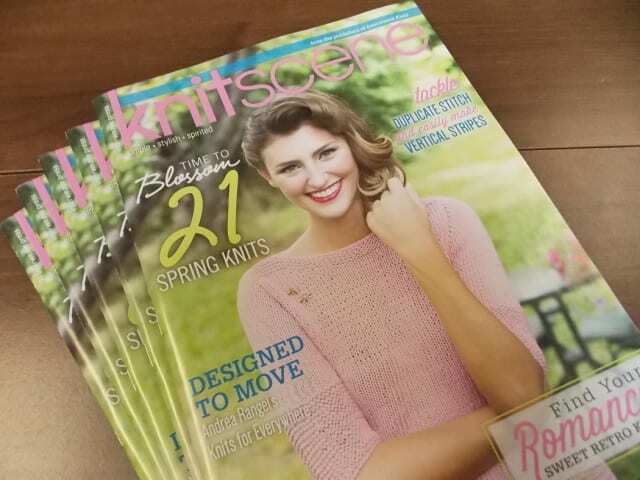 Just when cold weather finally begins here in North Carolina, the Spring 2016 issue of KnitScene arrives. 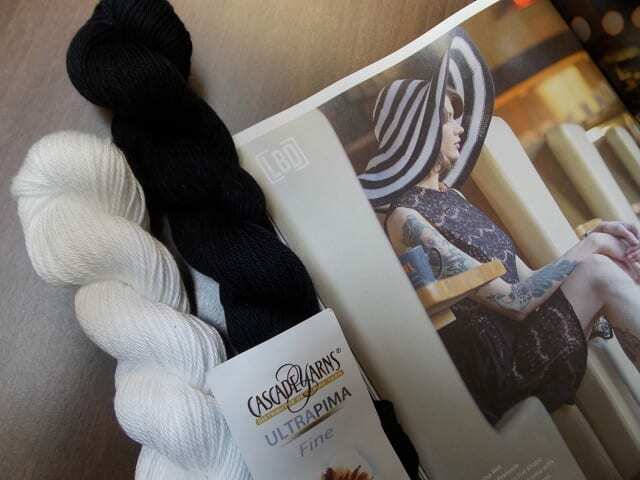 This issue features lots of yarns that can be found at the Hillsborough Yarn Shop. 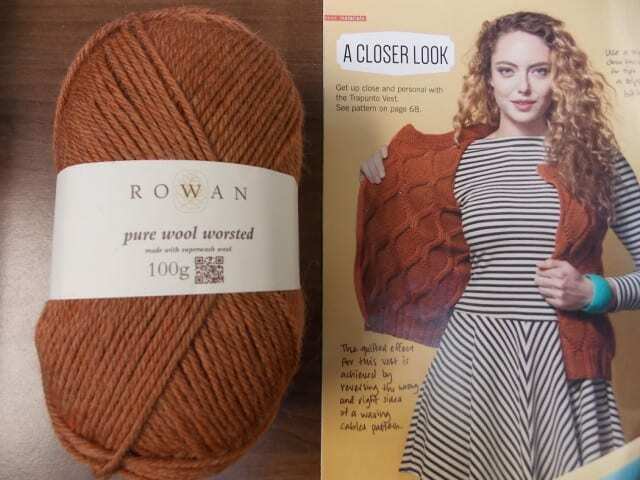 I also spotted a sweater in Rowan Pure Wool Superwash DK, along with a tutorial showing how to create those vertical stripes with crochet slip stitch. 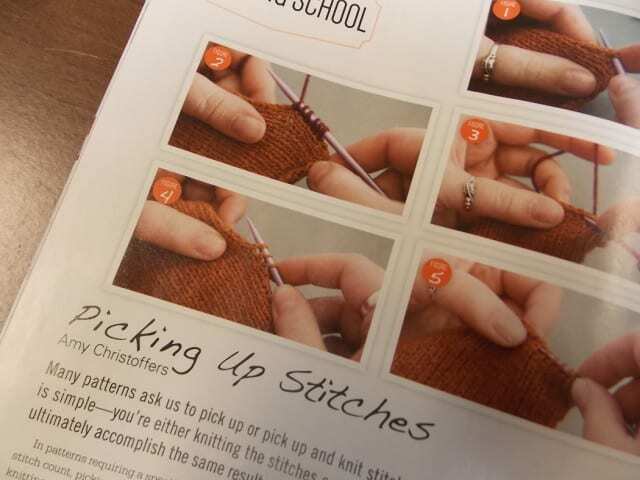 Designer Amy Christoffers penned another handy tutorial, showing how to pick up stitches. 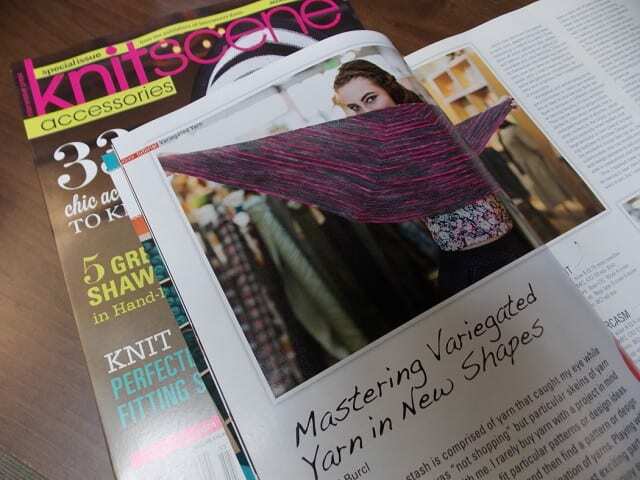 Look for KnitScene on the teacart here at the shop! See you there. 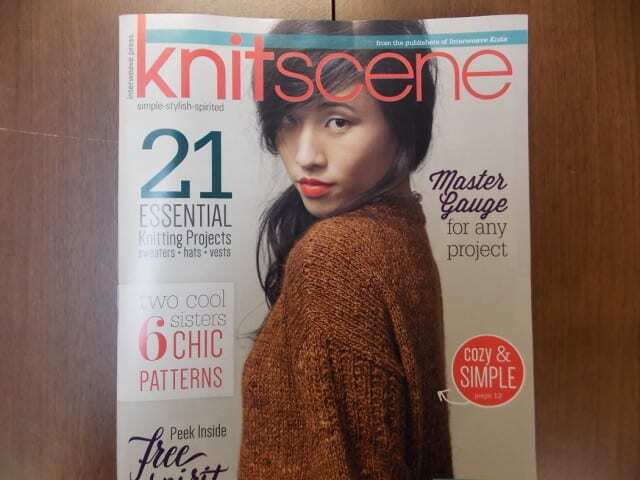 The Winter 2015 issue of Knitscene is here! 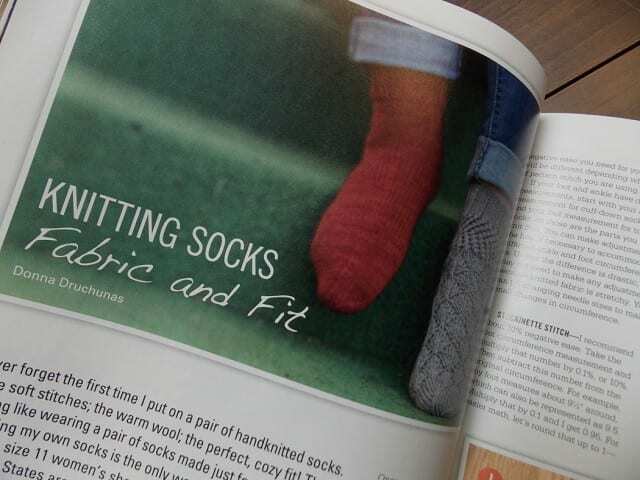 Sweater weather is finally here, making winter knitting magazines more appealing than ever. 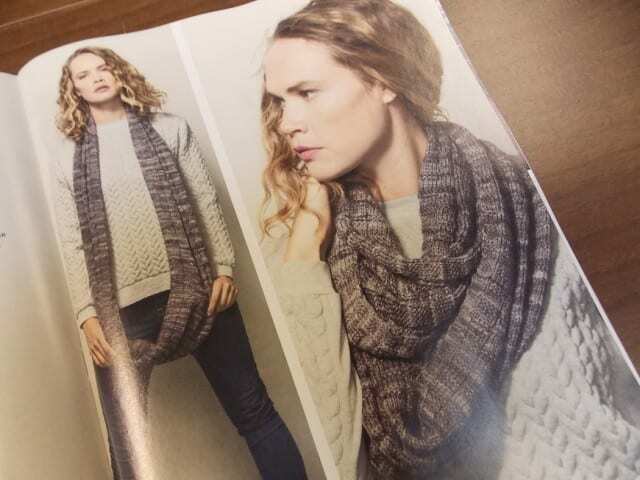 You can find all of those yarns here at the shop, along with lots of others that can be substituted for these patterns should you prefer a different color or fiber than what the designer used. 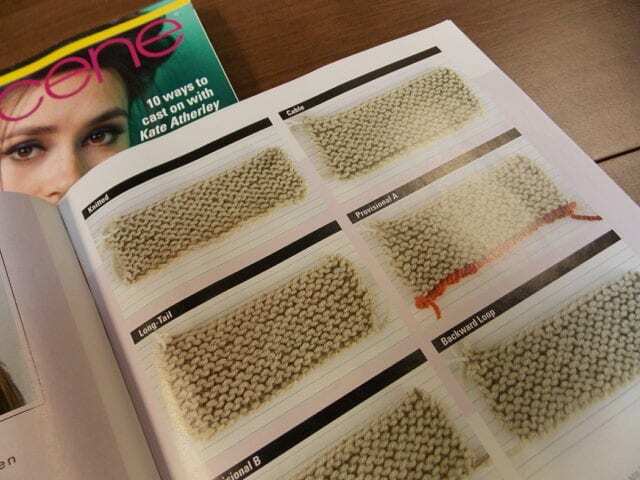 We’re always happy to help you decide which yarn is best for your pattern and project. 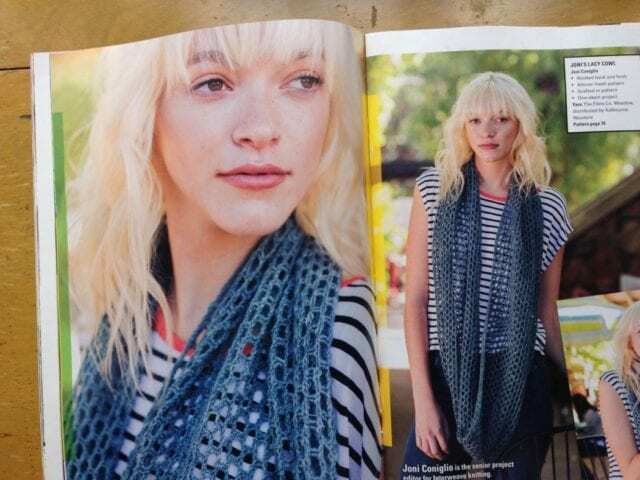 Come by soon to plan your fall and winter knitting! 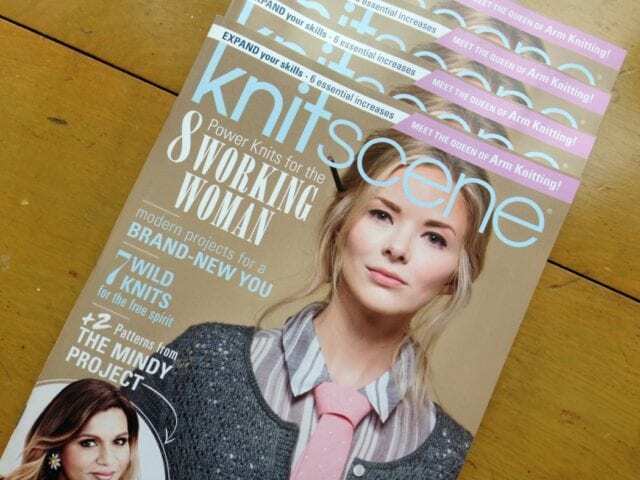 The latest issue of Knitscene is here! 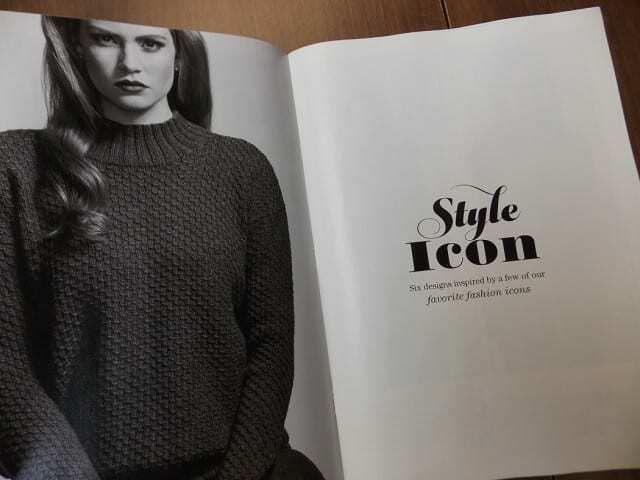 The Fall 2015 issue is packed with cozy garments and accessories, and flipping through it, I saw lots of familiar yarns. 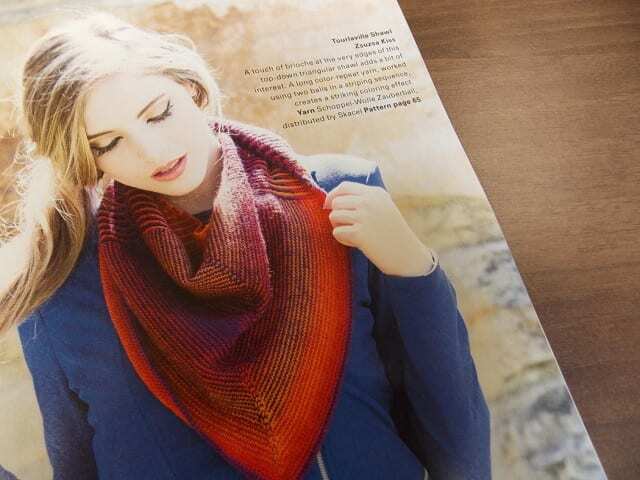 The clever “Tourlaville Shawl” is knit in Schoppel-Wolle Zauberball, working stripes from two balls of the same self-striping colorway to great effect. 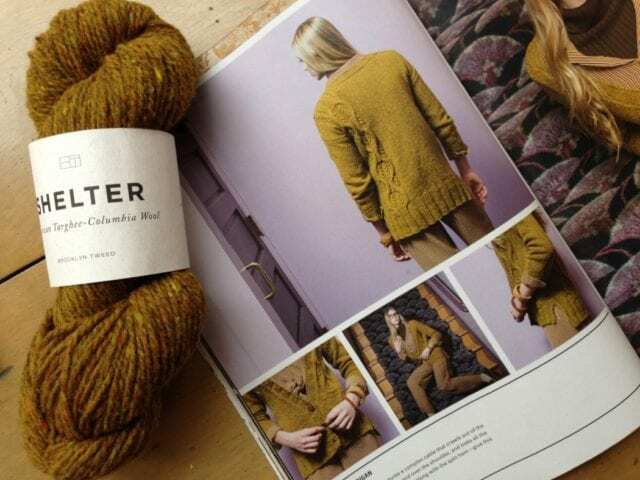 Mari Chiba’s “Canted Pullover” is knit in Swans Island Organic Washable DK, a deliciously soft superwash wool. 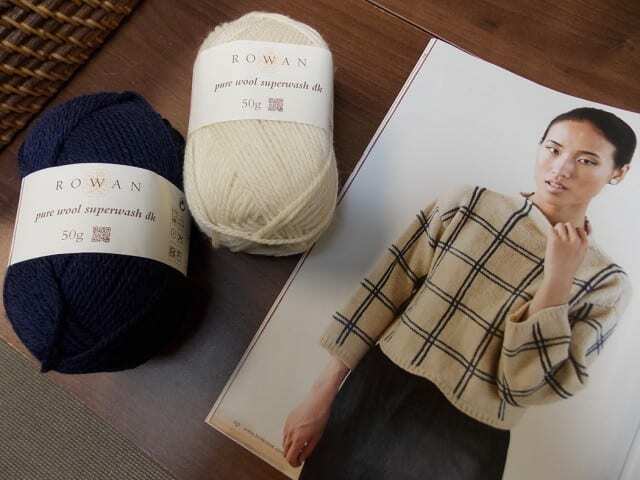 I was particularly struck by Leah B. Thibault’s “Cormac Sweater,” an openwork pullover ideal for autumn layering, and knit in none other than Shibui Maai. 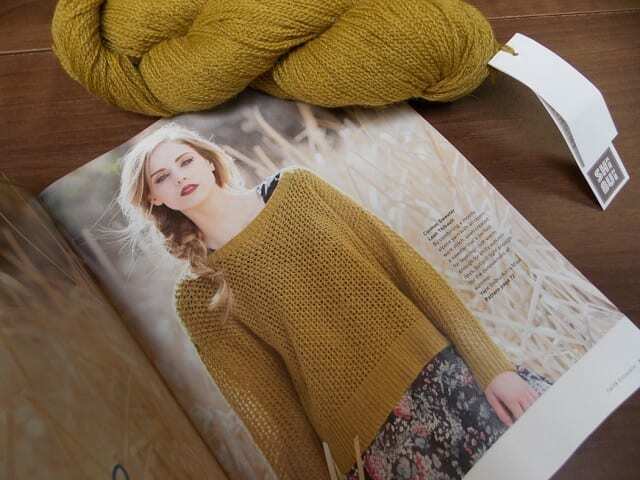 Look to this issue for lots of sweater inspiration, and a brioche tutorial, as well. 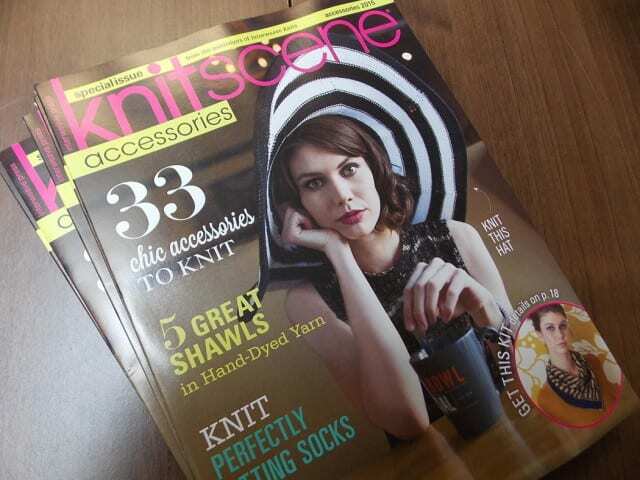 Come by the shop to pick up a copy of Knitscene and peruse the latest magazines and books! In this special issue, you’ll find small projects of all kinds: hats and mitts, shawls and scarves, cowls and socks, baskets and bags, jewelry, home goods, and more. 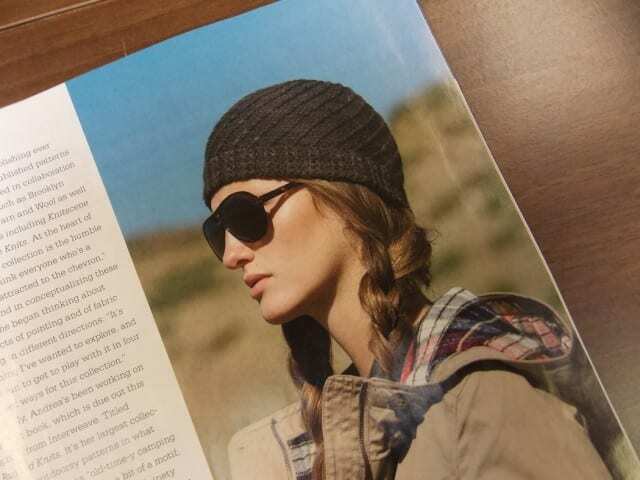 The eye-catching striped sun hat on the cover is knit in our most recently-acquired yarn, Cascade Ultra Pima Fine. Look for it in the sport weight section! 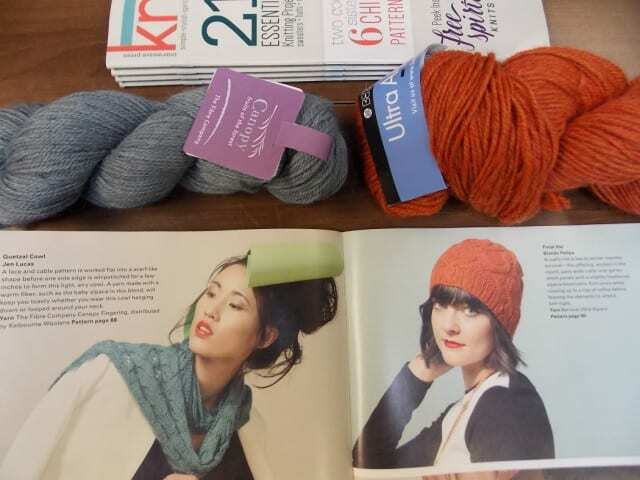 Come by the shop to snag a copy of Knitscene Accessories before they disappear, and plan a summer project or two!